What The Hell Do Old People Buy These Days? As you know, I recently spent some time in a Cadillac dealership. I highly recommend this if you’ve never done it. I think it’s the only brand where the F&I manager tries to sell you a package that consists of LoJack, VIN etching, and a mobility scooter. Just kidding! Today’s Cadillac dealers are energetic environments that include all sorts of young people, from muscular athletes to realtors interested in a good lease deal on an ATS. Yes, I admit, they still have the occasional old guy who’s getting an oil change for his Seville SLS even though he only drove it 796 miles since February. But he’s in the minority. Of course, it wasn’t always that way. Just eight years ago, Cadillac had the old person market cornered. Remember? That old DeVille sedan? With those enormous LED taillights? And that digital speedometer? With numbers you could read even if you left your glasses at bridge? Ahh, those were the days… the days when local authorities would follow up every “Silver Alert” with a call to the local Cadillac dealership. Well, Doug, I’m glad you asked. I’ll tell you exactly what happened: the cars became way too complicated. While I was at the Cadillac dealership, I took a seat in the all-new 2013 XTS sedan. By all accounts, this should be the old people bread and butter model. It’s front-wheel drive. It’s huge. It’s soft. And it’s styled like the designer was given careful instructions not to surprise anyone, because not every dealer stocks Depends. But when you sit inside this thing, you realize that this would never fly with old people. That’s because it has capacitive touch buttons, an LCD gauge cluster, a push-button starter, and Cadillac’s CUE infotainment system, which features “Bluetooth” and “Pandora,” two items old people probably think are suspense novels. As I played with the XTS, all I could think about was how sorry I felt for the dealership sales staff. Imagine trying to explain CUE to some old man or woman whose major experience with modern technology came when we switched from analog television to digital. It just wouldn’t work. Old people would leave the dealership as quickly as their mobility scooters would allow. An easy answer is Buick, because that’s been where old people who didn’t buy a Cadillac have been going for decades. But old people love big cars, and Buick doesn’t have one – not since they cancelled the elderly-friendly Lucerne. In fact, with the addition of the Cruze-based Verano, Buick’s lineup has been getting smaller over the years. This is contrary to Old People Car Requirements, which specifically state that their cars should get larger until, on their 80th birthday, they purchase a wheeled pontoon boat. Lincoln is the next best choice. Lincoln still makes a full-size sedan, called the MKS, or possibly the MKT. No one’s really sure, but they have a chart at the Lincoln dealer that describes everything in 47-point font. But here’s the thing: even the MKS is fairly complicated. 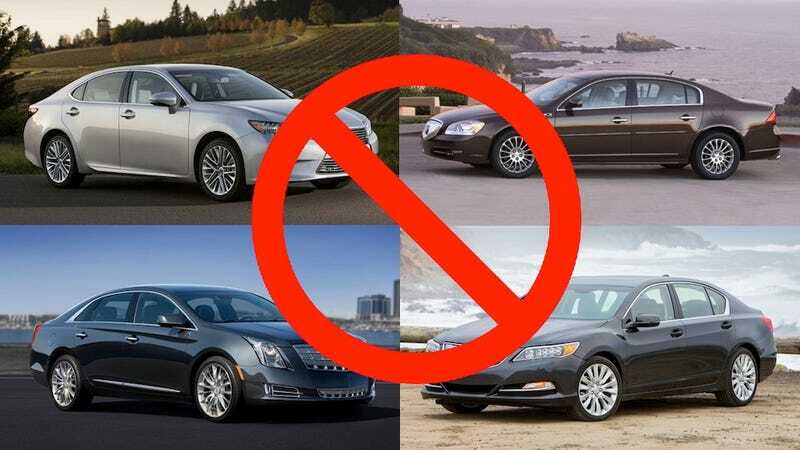 They all come standard with SYNC and MyLincoln Touch, which ConsumerReports believes is the actual devil, largely because it wasn’t created by Toyota. Plus: old people will probably be scared away by the giant, front-mounted nostrils. Lincoln dealers definitely stock Depends. So there’s Lexus. Oh, safe, dependable Lexus. Unflinching champion of the elderly since the LS400, which was developed by a group of Toyota engineers, designers, and marketers, whose sole mission was to a) create the finest luxury sedan in the world, and b) give it enormous taillights. They succeeded, and now they’re heroes in Japan, where Bluetooth and Pandora are anime characters. The obvious choice is the Lexus ES, which has never done a single sporty thing in its life. This is the automotive equivalent of those people who wear clothing with elbow pads. But it turns out, after I conducted exhaustive research on the matter (in other words: I visited Google Images), the new ES is even more complicated than the XTS and the MKS! Seriously: if you sit inside an ES, you’re faced with a large screen on the dashboard, buttons on the center stack, buttons next to the gear lever, buttons on the steering wheel, buttons to the left of the steering wheel, and – to top it all off – a center-mounted computer mouse. In fact, I strongly believe that Lexus is replacing its old, simple controls with complicated new ones in order to lower its average buyer age by deliberately confusing the elderly. Of course, there’s always Acura. They make the RLX sedan, which is so advanced it can now read the human mind and offer empathy, a fact car journalists briefly mentioned in reviews titled: “RLX Still Doesn’t Offer V8.” And there’s Chrysler, except today’s old people gave up on Chrysler during the 1970s and 1980s when they were making transmissions out of discarded electrical appliances. So I’m really curious: what are old people buying these days? Do they purchase complicated luxury cars and simply never use any of the functions? Or maybe they just resign themselves to keeping the Seville SLS running strong, with 800-mile oil changes and a fresh box of Depends on the rear parcel shelf.